Modern, sunny, comfortable 2-room apartment located on the 2nd floor of an apartment building at Ryszarda Kaczorowskiego street. After crossing the entrance door, we enter the small hall with the entrance to the living room connected to the kitchenette, bedroom, bathroom with toilet . The kitchen is equipped with permanent fixtures , new household appliances (fridge, oven, induction hob, dishwasher, hood, microwave, kettle) and full tableware and pots. The living room has modern furniture (sofa bed, coffee table, cabinet under the rtv), large LED TV. Air conditioning was installed in the bedroom and living room . The whole flat is in subdued , calm, timeless colors . High quality materials were used for finishing. The storage spaces are well thought out and fully utilized. In addition, you can rent a parking space in the underground garage and a bokówka. 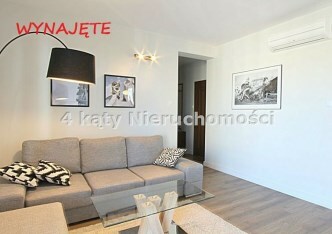 the rent is 1,800, - PLN + 140 administrative rent + meter fees (electricity, hot water, cold water, heating). It is possible to rent a parking space in the underground garage and a large basement . In close neighborhood there are numerous shops, service premises, school, kindergarten, nursery, headquarters of the Medical University, Polytechnic, headquarters of the Faculty of Architecture, doctors' surgeries, pharmacy, restaurants and pubs, bus stops. A playground is located in the courtyard.